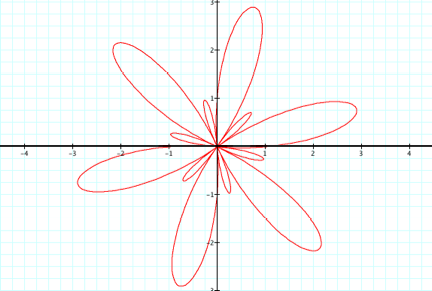 Our goal is to generalize the graphs that these equations will produce with different values of a, b, c, and k.
Note: Although all polar coordinates are of the form (r, q), we will use the x-axis and y-axis in describing our graphs. 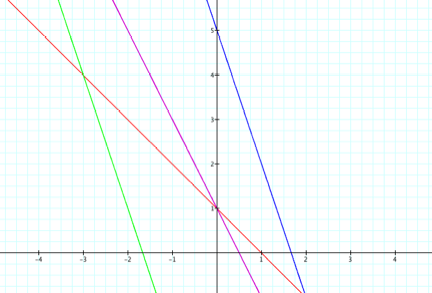 The following are graphs for k = 5 and k = 10, respectively, with the same a values as above. 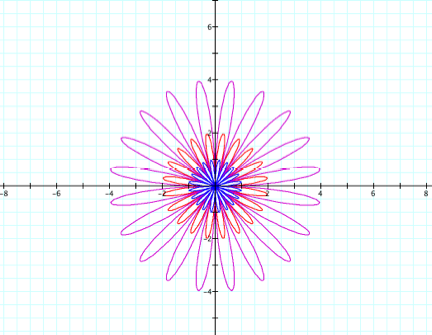 For integers k, we have the same pattern as in the case above, but the petals are in different positions. 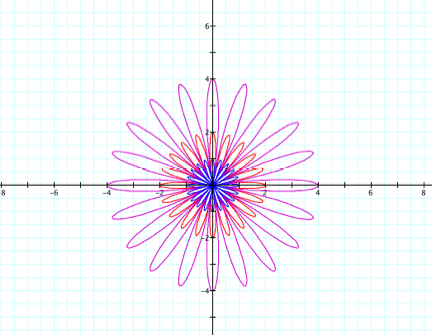 For the following graph, fix k = b = 1 and vary the a values. 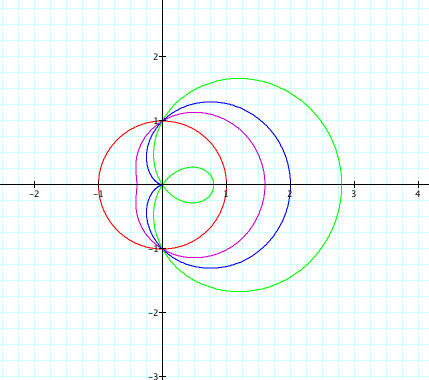 Now vary a = 1, 2, 3, 4 in red, purple, blue, and green respectively. 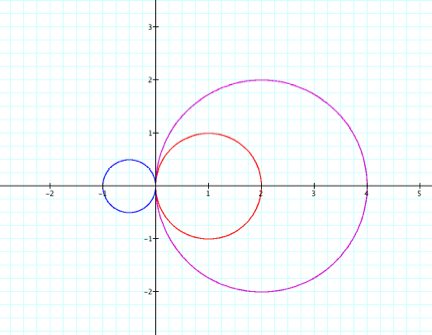 We see that as a increases, the function gets larger in size and the inside loop gets closer to the outside loop. 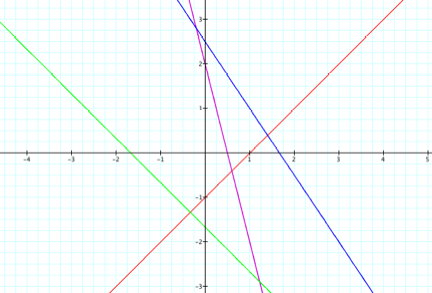 For negative a values, function is reflected across the y-axis. 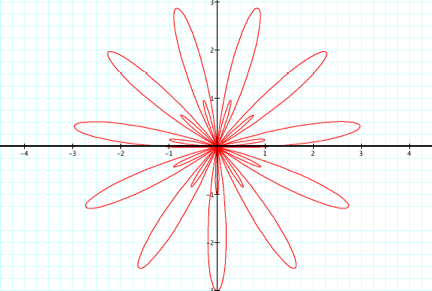 We see here that there are 11 large and 11 small petals, a total 22 petals, but notice that this time the small petals are inside the large petals. 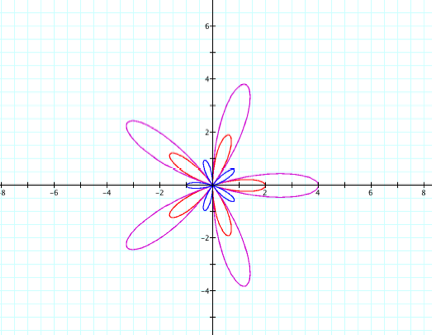 If k is odd, then the graph of the parametric equation r = 2asin(kq) + b (with b = a = 1) yields 2k petals, k of which are inside the other k larger petals. 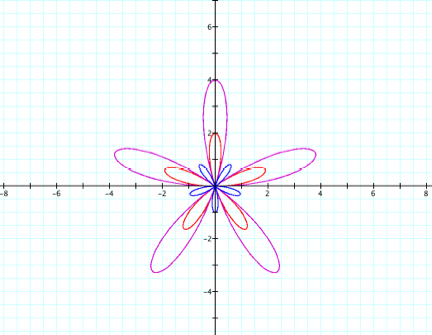 If k is even, then the graph of the parametric equation r = 2asin(kq) + b (with b = a = 1) yields 2k petals, where the k smaller petals are not contained inside the larger petals. 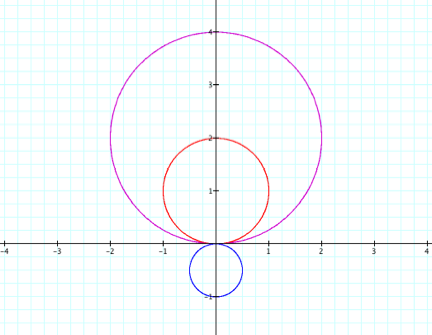 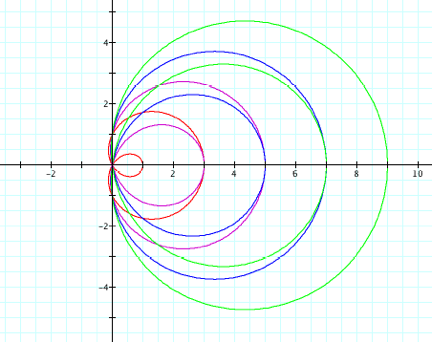 For k = 0, we get a circle of radius b, and for k non-positive, reflect the graph over the x-axis. 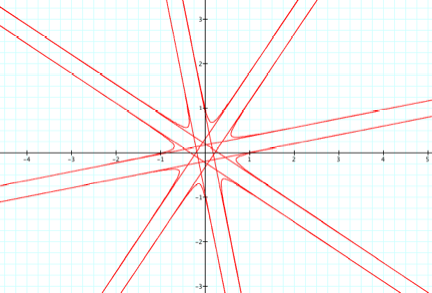 We see that the line always intersects the y-axis at y = c and it intersects the x-axis at c/a. 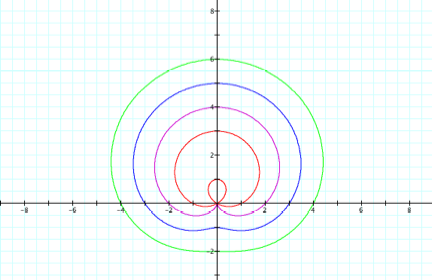 Now we will use the same values of a and c as above, but we�ll now vary b as well. 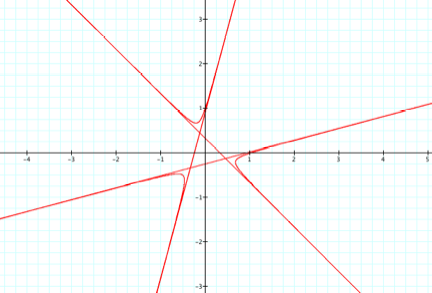 We see that the lines still intersect the x-axis at c/b, but now they intersect the y-axis at c/b. 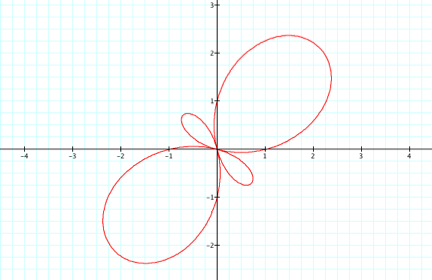 In the parametric equation r = c / (acos(kq) + bsin(kq)) we have that for any nonzero integer k, if k is even, then the parametric equation yields 2k non-intersecting curves, and exactly one of these curves intersect the x-axis at x = c/a, exactly one (different from the first) intersects the x-axis at x = -c/a, exactly one intersects the y-axis at y = c/a, and exactly one intersects the y axis at y = -c/a, where a and c any nonzero real numbers. 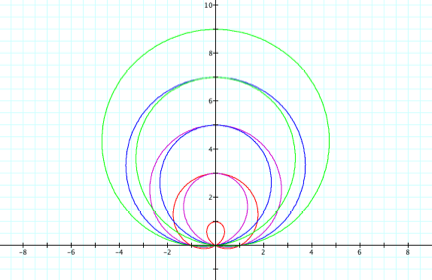 If k is odd, the equation yields k non-intersecting curves (for k = 1, we have a line), and exactly one of these curves will intersect the x-axis at either positive or negative c/b, and exactly one curve (different from the first) will intersect the y-axis at either positive or negative c/b, where b and c are nonzero real numbers. 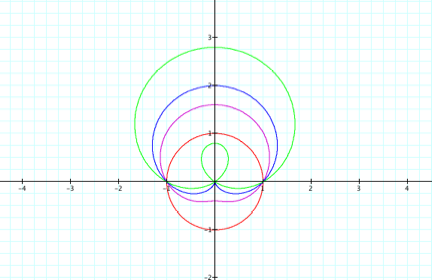 If one curve intersects an axis at a positive c/b, then the second curve must intersect the other axis at negative c/b, and vice versa.